It’s been a while since I did a wedding update, so I thought I’d write a short one here. Warning: there won’t be any pictures. Tim knows I have a blog and I don’t know if he reads it or not, but I don’t want him to get spoiled on what my wedding dress looks like before the big day. Right after we got engaged, I told everyone we were going to focus on getting the venue, but wouldn’t do much else before Christmas. I even told myself that I wasn’t going to think about looking at dresses until January or February. Then, while perusing Facebook one Friday, I saw that my sister had tagged me in a post about a big sale at a local bridal shop. On an impulse, I called them and asked a few questions (how long was the sale going to last, what sizes were available, etc.) and ended up making an appointment for that Saturday. My mom and my sisters met me there and we started looking around. The first thing I noticed: there weren’t as many good sales as I was hoping for. But, determined to give it a shot, we walked around and picked out some to try on. I knew the style I wanted and the first dress that I put on fit that style. I loved it. I ended up trying on a few more dresses, but none stood out to me like that one. The problem was that it was a little over my budget. I wasn’t quite ready to commit to paying that much, so we ended up leaving. I did some research online and realized that dress was the same price pretty much everywhere, so I decided I would just try on dresses somewhere else. My best friend, Katie, who lives in Dallas mentioned that she may be able to come up sometime and go with us, so we planned out a weekend and she made plans to come. We ended up going to David’s Bridal. I knew they would have a large selection and was optimistic I would find something similar to the dress I originally liked. The first dress I put on was really similar and I absolutely loved it. I remember my consultant asking me what I would rank it and I said, “I don’t want to say 10 because it’s the first one, but I really like it.” We tried on several more dresses, but I just kept coming back to that one. I was a little reluctant because my sister didn’t act like she completely loved it, but there was just a feeling inside of me that told me it was “THE DRESS”. I asked to put it on one more time and the decision was made. The best part is that it was much closer to my budget. I wish I could share pictures, but you all will just have to wait and see! 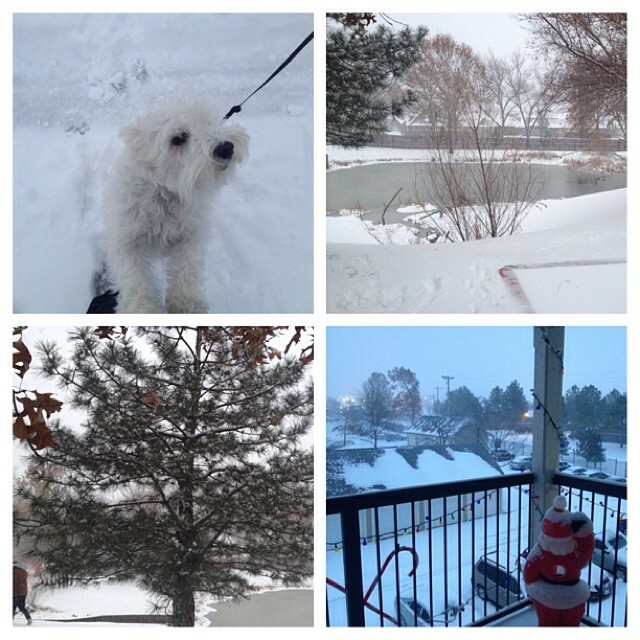 Just when I got into the routine of updating my blog again, I got thrown off by Thanksgiving, traveling to Dallas for a long weekend, a snowstorm, and being busy from general Holiday stuff. So, what have I been up to? 1.I spent Thanksgiving at my Mom and Dad’s house with family. I indulged and ate way too much, but it was so good! 2.Tim and I went to Dallas for a long weekend the Friday after Thanksgiving. We visited my best friend, Katie, on Friday and had a second thanksgiving meal with her, her husband, and her family. We then spend Friday night-Monday morning with Tim’s parents. It was a nice, relaxing weekend. I may have partaken of too many “Corona-rita’s” on Saturday night, but I did manage to get a run in on Saturday morning. 3.The week after Thanksgiving, it was back to work. I had taken Monday off, so I was looking forward to a 4 day week. We had been hearing all week about the possibility of snow that week/weekend, but I was kind of reluctant. We haven’t had any good snow in Tulsa in a couple of years. This storm lived up to the forecast though. Snow started on Thursday (which meant we got to leave work at 2:00) and lasted into the morning on Friday. We ended up with about 5 inches of snow and a Snow Day off of work on Friday. I love snow, so I was definitely excited! Plus, it was fun to relax in my warm apartment for a few days. 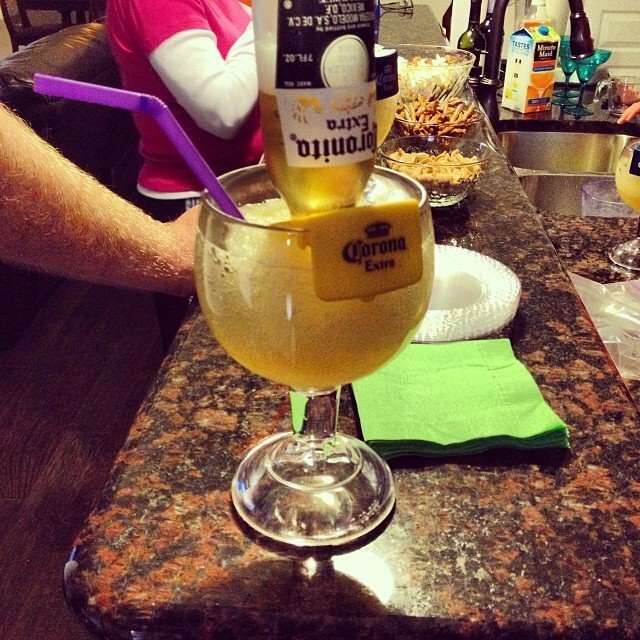 4.I had friends over for a Holiday party on that Sunday. We ate Mexican food, played Cards Against Humanity, and got to visit a lot. We don’t get to all get together as much as we used to, so it was fun. 5.Last week was a full week of work and trying to get back into going to the gym and working out. 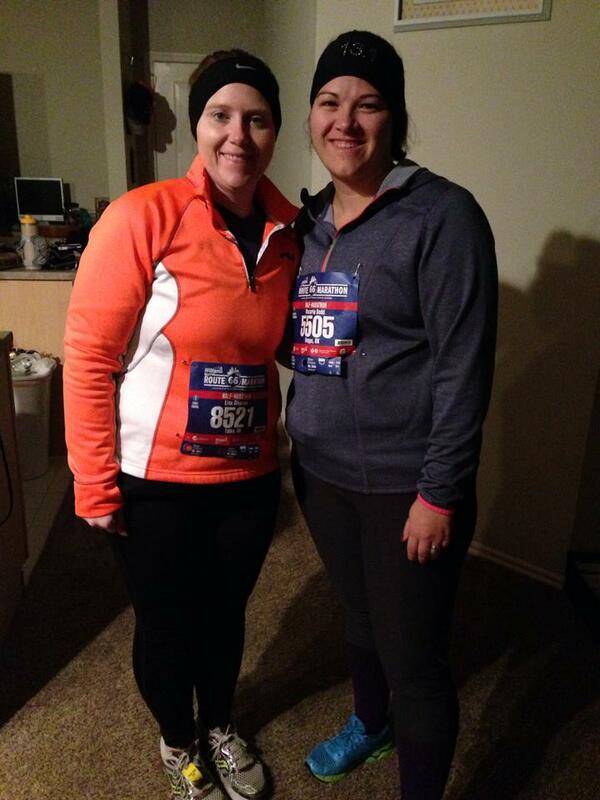 Since the Half Marathon, I had only run once (3 miles when I was in Dallas) and hadn’t done much else. My first treadmill run last week wasn’t good (30 minutes at .5 mile run, .1 mile walk), but Saturday I did 3 miles with no walking breaks. It’s always an adjustment to switch from running outside to the treadmill for me. I get bored and I want to stop. I have also being doing push-up, sit-up, and squats using apps on my phone. And I got strength training in two days last week. 6.This weekend I finished up most of my Christmas shopping and went to a family Christmas party, which is always fun! I got to see some of my favorite Texas cousins and spend time with the rest of my family, including my nieces and nephew. 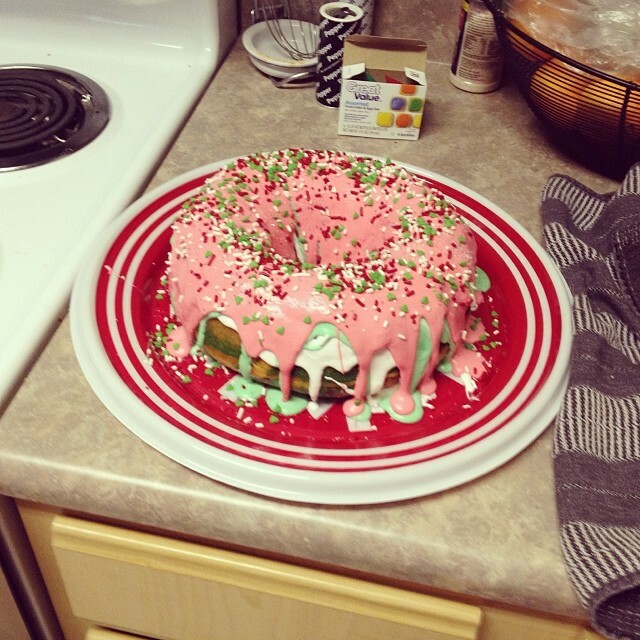 I also made this fun Christmas Wreath Cake (It was marbled red, green, and white on the inside). That pretty much catches you up on what I’ve been doing the past few weeks. I’m looking forward to this last week of work and then a week and a half off (the benefits of working for a University!). After touring the Oklahoma Jazz Hall of Fame and the Glenpool Conference Center, I knew that one was clearly sticking out as the better option for us, and I knew that Tim felt the same way. The Glenpool Conference center was what we were looking for. I texted my family and a few friends asking what they thought about an October wedding. I got mixed responses. My best friend, Katie, said she loved the idea of a fall wedding. My mom and my sisters had a few questions. They knew how much I wanted to get married earlier, so I think they were a little resistant at first, but once I explained how much we liked it and that that was the earliest availability, I think they were definitely on board. We went home a did a little number crunching, and even with adding on table and chair rental, it was still a really good deal. Plus, the first availably October date was October 18th. This would be a year to the date of our engagement, so it had to be fate, right? I was careful not to get my hopes up, but I really wanted that date. Monday morning I tried to call as soon as they were open, but got no answer. Unfortunately, I had to go into a meeting, so I was just crossing my fingers that it would still be available when I got out of the meeting (I’m a little paranoid). I have a pretty amazing fiancé though, because while I was in the meeting, he was able to get ahold of the person in charge and took care of making our reservations! So, the wedding venue and date are set: October 18, 2014 at the Glenpool Conference Center. We have tentative plans to do the ceremony outside (with a back up plan in case of bad weather) and the reception inside in one of the exhibition rooms that opens to the foyer. I am really excited (and nervous) about making it all come together like I want it. We don’t plan on hiring a wedding coordinator, so I know I am going to be relying on my amazing family and friends to help things run smoothly. It felt so good to get this decision made and off of our plates. 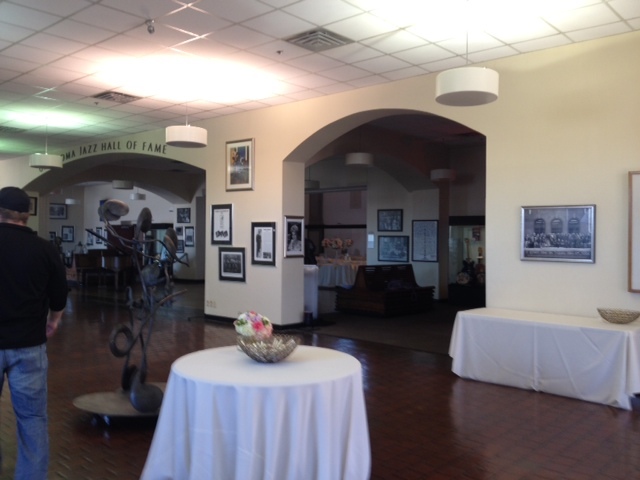 The second venue that Tim and I decided to tour was the Glenpool Conference Center. 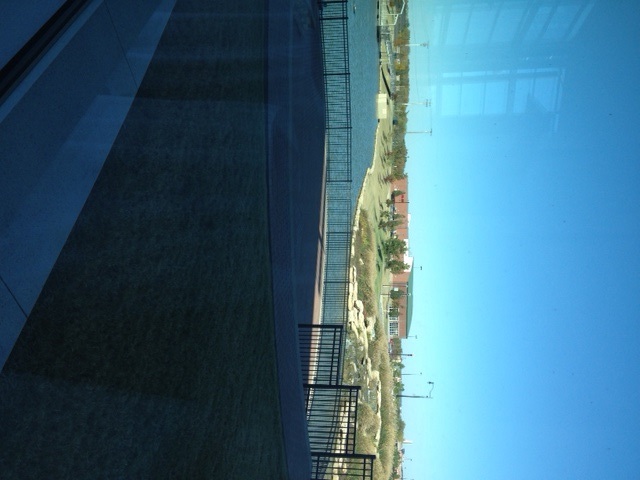 Glenpool is located just south of Tulsa and this conference center has just recently been built. I was drawn to this place because it was new, looked nice, and had a reasonable price. The only downside was that the closest hotel was not in walking distance, so we would have to arrange a shuttle to and from the hotel. The doors were locked when we showed up, so we snuck in with the people delivering the cake for a wedding reception they were having that evening. We walked around and looked at the different available rooms. 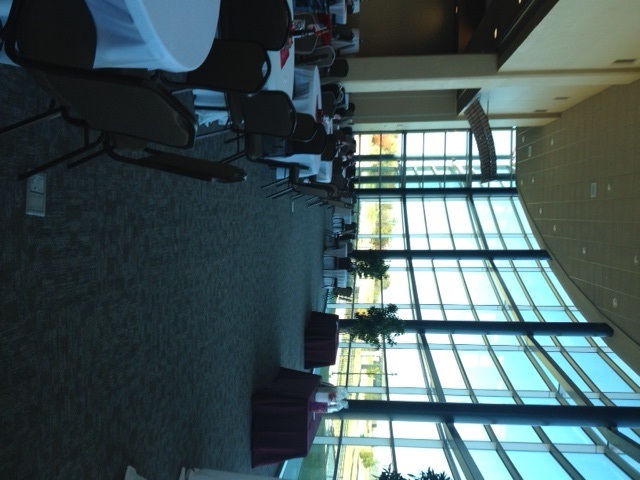 Along with a few big rooms, this conference center offered an outdoor amphitheater that could be used for the ceremony. Tim made a comment that if we were getting married at a different time of year that it would be nice out there, but it would be too hot in August (we looked at their online calendar and that was their earliest available date…so much for a June wedding!). I was kind of surprised because he had always said he didn’t want an outdoor wedding. We met with a few different people from the conference center and they gave us some information. We discussed several different possibilities for how we could hold both the ceremony and the reception. I loved the way it looked. 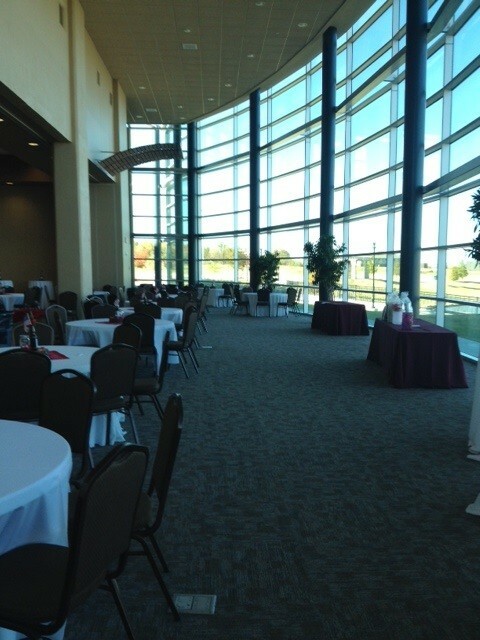 If you rent the foyer area, you get an area with big glass windows looking out onto the amphitheater and pond area. Our biggest concern coming in was that there wasn’t a hotel in walking distance. That problem was solved by the fact that there is a hotel currently under construction right next door! It is slated to open at the beginning of next year, so should definitely be open in time for the wedding. We went upstairs and looked at the calendar of open dates. She flipped it to August, where we thought there were openings, and it turned out they were all booked. Starting in March, every weekend is booked until October. I was so upset. I had my heart set on a summer wedding (I’m impatient!). She let us know that we had some time to think about it since they don’t book appointments on the weekend. I definitely had a mix of emotions when I left there. My weight has been something I’ve battled with for as long as I remember. I grew up overweight, gained more weight when I went to college and got my first “real job”, joined weight watchers and lost 140 lbs. to reach my goal weight and become lifetime, stopped weight watchers and gained 35 lbs, and now am struggling to lose it again. I’ve said it time and time again during this journey: “I’m back on track”. But somewhere along the line, something inevitably happens and I stop making progress. Sometimes I feel hypocritical saying “I’m back on track” because I know I’m still struggling even if I am trying to refocus. This summer I decided I was going to rejoin Weight Watchers. Although I had hit lifetime, because I had gained so much weight, I was going to have to become a paying member again. So I jumped back on and started slowly, but steadily, losing weight again. I liked that rejoining weight watchers helped me break up with the scale again. I tend to get into the habit of being a “daily weigher” when I am really focusing on my weight loss. When I rejoined WW, I stopped weighing at home and only weighed once a week. Over the course of a few months, I lost a little weight, but I could feel myself heading towards an unhealthy path again (don’t eat very much on the days leading up to weigh in and then splurging too much afterwards). This, of course, wasn’t giving me the results that I wanted. All of that, on top of the fact that I am now planning a wedding and needing to save money for that, led to me deciding to stop Weight Watchers again. I know Weight Watchers works. It worked a miracle for me once. But right now I need to figure out how to do this on my own and how to do it in a healthy way. Unfortunately, when I stopped going to WW, I also relaxed too much. Because I don’t have a formal weigh in every week, I have decided not to weigh at all and to relax my eating. Not my smartest move! Get back on the scale-I know I shouldn’t be reliant on the number, but it will help keep my accountable. I still only want to weigh once or twice a week though. Drink Water- I used to be so good about this, but I have fallen off the wagon lately. I know the importance of staying hydrated, so I am determined to get back to that. Eat more fruits and vegetables- Once again, I have just been too relaxed. I love fruits and vegetables. I am still eating a couple of servings of fruit each day, but my vegetable consumption has been really lacking. Come up with an exercise routine- Because I have been so focused on Half Marathon training, I haven’t really been doing much else. I have managed a strength workout about once a week, but I know that’s not enough. I was doing really well when the weather was nice. I would get up and run in the morning and then go to the gym in the afternoons. But now that it’s cold, I have been running after work instead of early in the morning. I still think this is going to be my plan, but I am going to have to make an effort to make it to the gym every afternoon and only take once rest day a week. Hopefully making these few small changes will get me focused. I have a wedding dress that I want to look good in! Plus, I definitely don’t want to gain weight because then it won’t fit! When Tim and I got engaged, we tentatively chose June as a good wedding month. We knew that one of the first things we needed to choose was a place to have the wedding because venues book up so fast. We did a lot of researching online and threw around a lot of ideas, debating on whether we wanted the venue and reception in the same place, whether we wanted the ceremony in a church, where we wanted it to be, etc. After doing some research online (and realizing how expensive everything is! ), we narrowed it down to two places we wanted to go visit. Both of these places allowed for outside catering, which we knew was going to save us a bunch of money and both met at least some of our criteria. 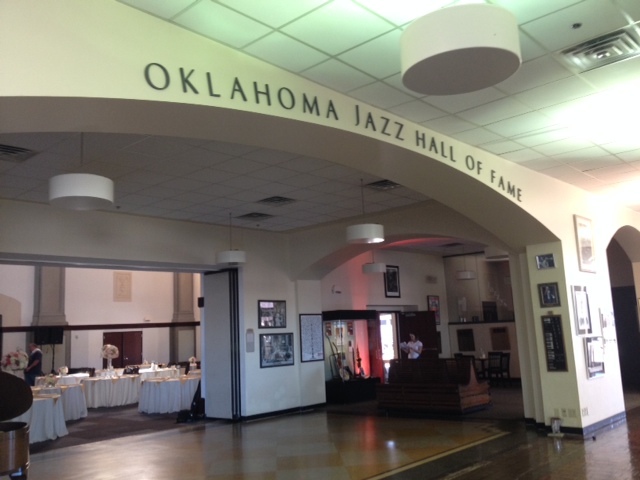 The first place we visited was the Oklahoma Jazz Hall of Fame. 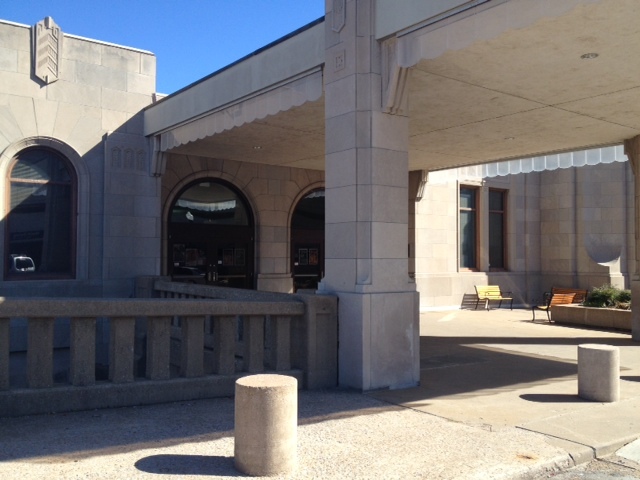 It is housed in an old train station in downtown Tulsa. The reason I was drawn to it was that it was a unique venue (and I knew it would make for some really good pictures!). When we got the venue for our appointment, the doors were locked, but this gave us an opportunity to talk to a dad who was preparing for his daughter’s wedding that day. He told us he loved the place, but you really had to stay on top of the owners. Once we got in, we looked around on our own for a little bit. 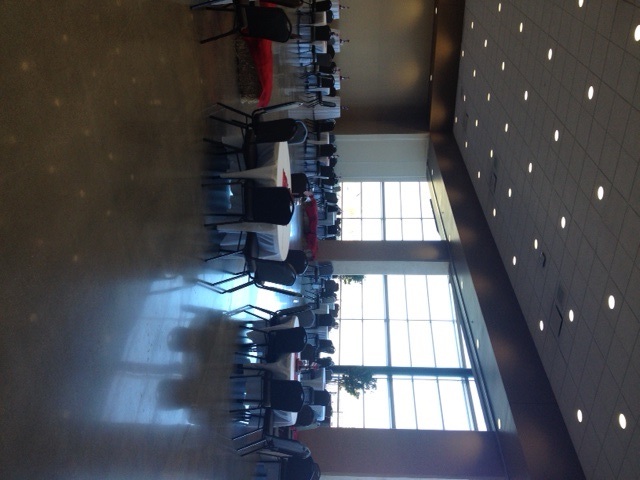 We were able to get an idea of what a wedding reception could look like because they were setting up for that evening. It really was a beautiful place, and it was unique. I mentioned to Tim that it had a little bit of an “old building” smell, but he said it didn’t bother him. We were given a tour by the owner and he explained to us how a ceremony/reception combo could be done (they would tear down the room after the ceremony and set up tables). The earliest availability they had was July. He was very nice and helpful and we left there with some definite pros and cons. Overall, I left with a pretty good impression of the place as a possible wedding venue.